plus love triangles and double-cross-dressing! Lyric Opera of Chicago presents the perfect midwinter getaway: a beautiful production of Richard Strauss’s delectably bittersweet romantic comedy Der Rosenkavalier, which opens on Monday, February 8 for eight performances. The opera stars Sophie Koch (Feb. 8-20) and Alice Coote (Mar. 4-13) in the title role as the teenaged “Rose Cavalier,” Octavian, who is amorously involved with a woman twice his age, Princess von Werdenberg, a.k.a. the Marschallin, sung by Amanda Majeski. Her cousin, the boorish Baron Ochs (Matthew Rose/debut), plans to marry Sophie (Christina Landshamer/American debut) for her family’s money. Sophie, however, falls hard for the betrothal messenger Octavian instead, and he with her. Much merry confusion ensues – including Ochs pursuing a chambermaid who’s really Octavian in disguise – before the rapturous trio and duet that conclude this musically divine comedy, when the Marschallin releases her young lover and Sophie and Octavian are united. Edward Gardner conducts the production directed by Martina Weber (both debuts). Sets and costumes are designed by Thierry Bosquet with lighting by Duane Schuler. Michael Black is chorus master. Performance dates are February 8, 13, 16, 20, March 4 and 7 at 6:30pm; and March 10 and 13 at 1pm. 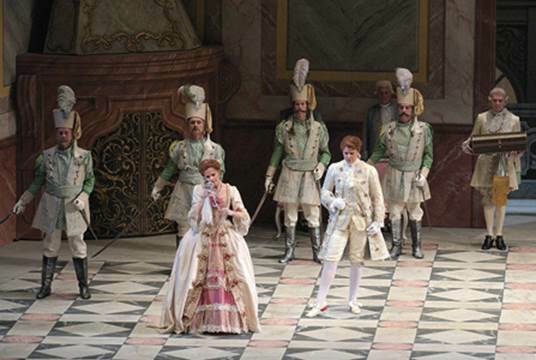 For tickets and information call (312) 827-5600 or go to lyricopera.org/rosenkavalier. Lyric’s presentation of Der Rosenkavalier is generously made possible by an Anonymous Donor and Mr. & Mrs. Dietrich M. Gross. Founded in 1954, Lyric Opera of Chicago’s mission is to express and promote the life-changing, transformational, revelatory power of great opera. Lyric exists to provide a broad, deep, and relevant cultural service to Chicago and the nation, and to advance the development of the art form. Lyric is dedicated to producing and performing consistently thrilling, entertaining, and thought-provoking opera with a balanced repertoire of core classics, lesser-known masterpieces, and new works; to creating an innovative and wide-ranging program of community engagement and educational activities; and to developing exceptional emerging operatic talent.